To all the fellow TH7 players, the utmost danger is demolition of the TH7 War Base with the traditional dragon attack. This by far is the most predictable and used attack in the war to gain all the 3 stars. 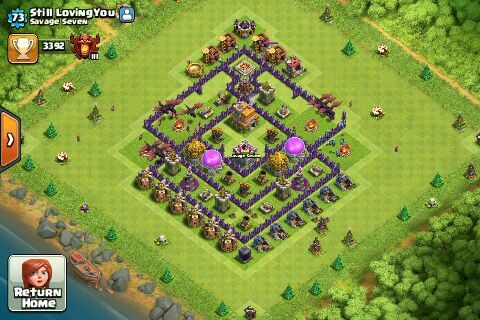 TH7 War Base limits the potential of the defense to hold out against the dragon attack. 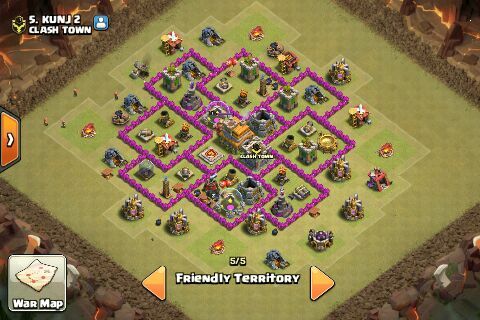 Therefore everybody on TH7 tries to build an anti-dragon base to try and prevent giving the attacker 3 stars. To succeed in war and prevention of the 3 star raid is as important as gaining 3 stars while attacking in war. Just like in football, the defense will win you wars. Therefore the defense needs to be as strong as your attacking tactics. 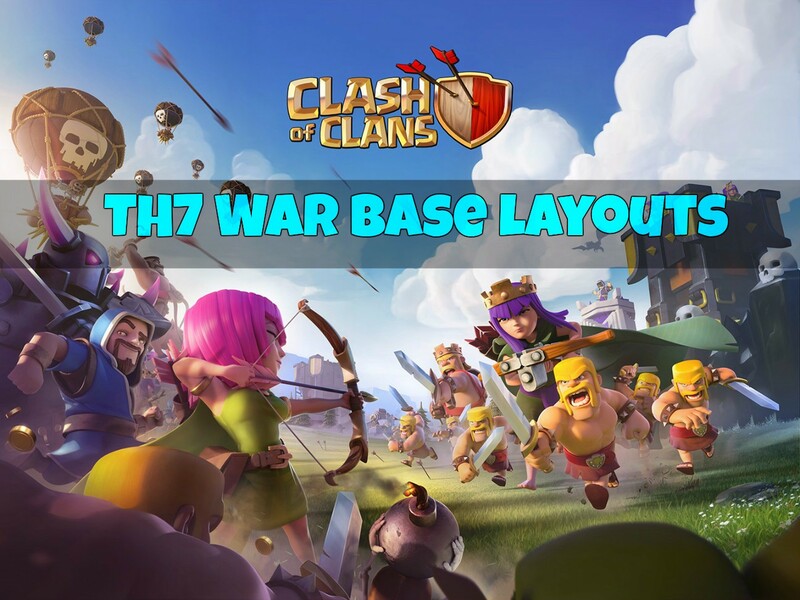 We have collected these War Base Layouts of TH7 from our clans which may help out plan your defense and village from getting raided. 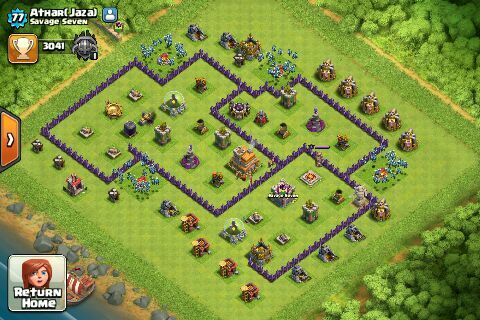 Remember, to hold out against TH7 War Base maxed dragons you need to to have great tactics in mind. The layout must be planned to surprise the attacker(if he is not using x-mod:p). All the surprises aka traps play a very important role in minimizing the damage to your village during a raid or an attack. You should be creative while placing the traps. They should not be predictable. Try placing spring traps to bounce back the troops trying to awake your clan warriors. You would need to keep on experimenting with new layouts to get to know about defense and protecting your village. 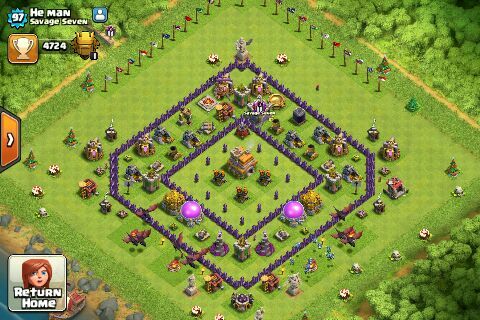 Just keep on customizing your War Base to surprise the attackers and prevent them from taking 3 stars. Do keep all the builder houses at corners to buy you some time or at least annoy the attacker. 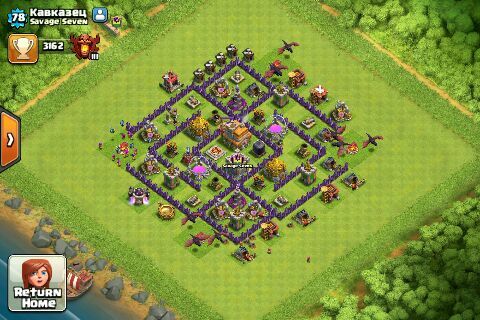 Take a look at our COC TH7 War Base Anti Everything Layouts. 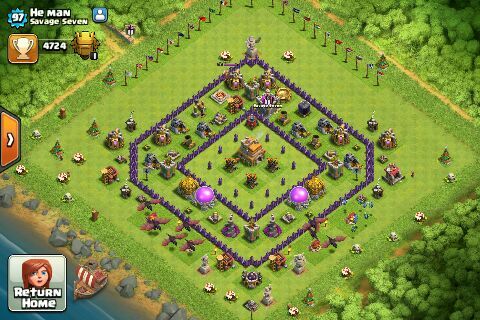 Take a look at our TH7 War Base Anti Everything Layouts and design your own custom TH7 Layout or just copy one from here. Have a Great War!! 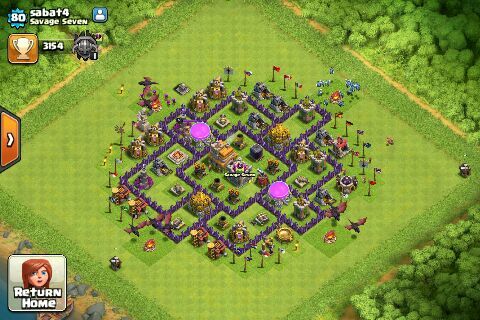 This is another good layout for TH7. 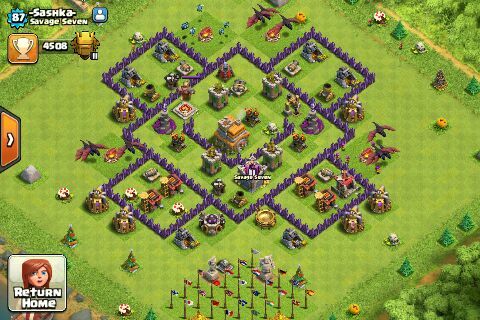 This layout is made by Linun, one of the members of the clash of clans group.I too, used it when I was at TH7 struggling with dragon attacks in war. All the key features are described by the designer of this war base. The CC itself cannot be triggered unless the attacker is determined and has a well-planned strategy. Those consist of using hogs at certain points of outside defenses or using a small group of giants to move within the base alone to pull it. With the absence of a poison spell at TH7, this makes the CC even more of a threat! It is very easy for an attacker to obtain at least one, two, or maybe three of these targeted buildings, but it is nearly impossible to seize all of them. Each resource building has its own compartment to keep it safe and sound! These always catch support troops that are not under the cover of a tanking troop. They can also scramble up a well-funneled deployment. Having these type of bases force the attacker to study the entire base instead of a half or a fourth to know exactly how to tackle it. Nearly all dragon users attack behind the sweeper, correct? Yessir. On that same side, three storages, a TH, a BK, and all air traps are there to halt them dead in their tracks. Wall breakers will only be able to open up one compartment at a time. Most actually do not know, but having these paired together have been tested and proven successful to eliminate groups of TH7’s level two hogs (please, correct me if I’m wrong lol). 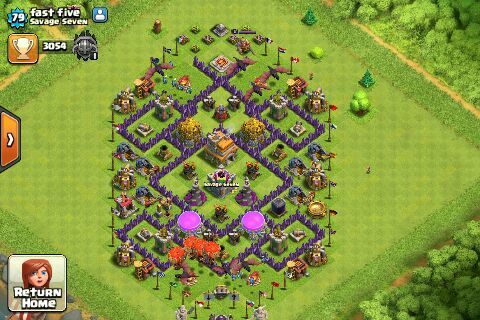 These are from ParadoxalAxioma, another pro member of the Clash of Clans community. These are exceptional and defend your village from attacks. This base was made to be anti-drag, the ad island in the centre requires a good funnel to reach it. The wizard/tesla farm is to surprise the attacker because they do a lot of damage if they are maxed. 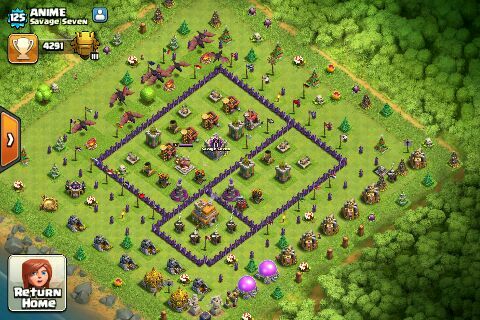 AS should be pointed away from the ad island , because if they zap it this base will be easy to three star. Tried to make it hard for drags and ground attacks. 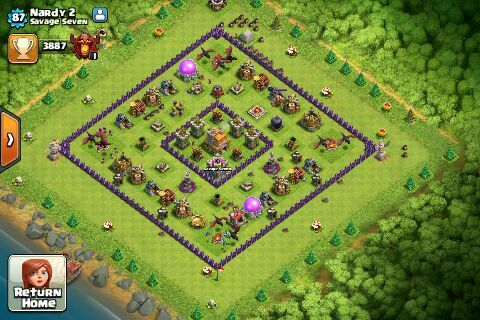 How To Install Clash Of Clans on PC?